Successfully Added 4-In-1 C Hub to HDMI 4K 2 USB Port Adapter for MacBook Pro 2016 2017 Google Chromebook Samsung Galaxy S8/S8+/S9/S9+/Note 8 to your Shopping Cart. 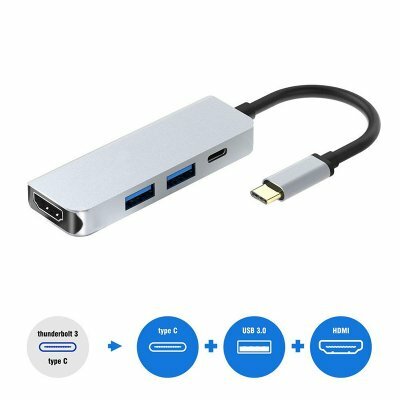 USB C to HDMI Adapter with 2 USB3.0A and PD charging port, enable insert 4 devices simultaneously. Dual USB 3.0 ports support transmission speed rates up to 5Gbps, the 2 USB ports can be used simultaneous, also allow you to connect keyboard, mouse, U flash Drive. Stable connection, you won't have to worry about losing connection to your computer even by the slightest movement. Simple to use, just plug and play, portable size, easy to carry and use.